to accurately pinpoint the location of UXOs. 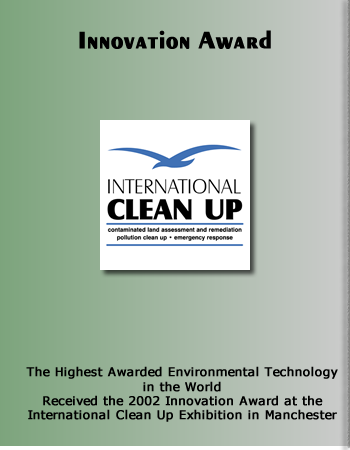 in hydrocarbon clean-ups, soil/water rehabilitation and absorbents. 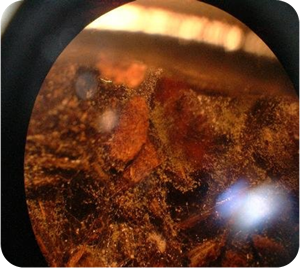 on contaminated sites are confirmed by drilling at various depths. 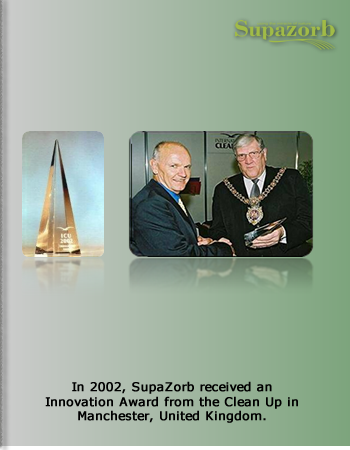 SupaZorb is internationally recognized for its expertise in water purification systems and oil absorbents. In addition, we also developed a wide range of products to address the needs regarding hazardous materials - this was done upon request of our clients. 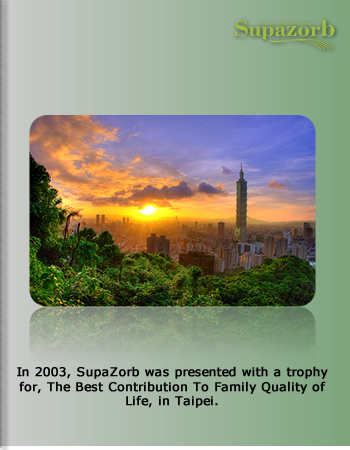 SupaZorb established a good name for itself by publishing numerous research articles throughout the world. 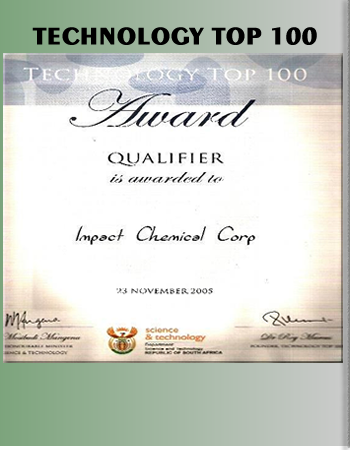 Our product is SABS (South African Bureau of Standards) approved and tested by over three Universities in South Africa. SupaZorb is unique in the sense that it not only consists of 100% organic material, but its combination of specific micro-organisms ensures that it can be applied endlessly. The main purpose of the micro-organisms is to feast on toxins, namely oil, petrol, diesel, blood and much more. 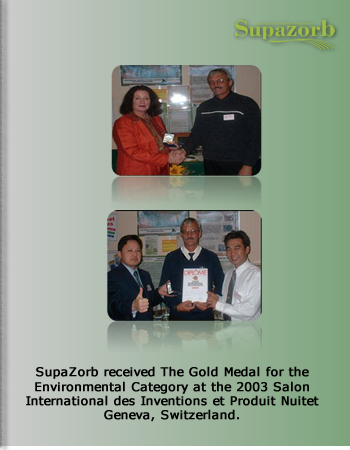 SupaZorb was involved with the oil clean-up of the Jolly Rabino at Richards Bay. Governmental Departments: Hydrocarbon Spills, Training & Bio-remediation. 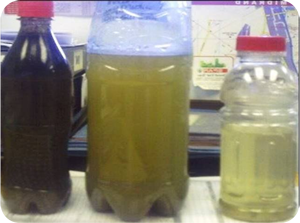 Sample on the left: Wash bay discharge is only maintained by grease traps. Sample in the middle: Wash bay discharge is maintained with a sand filtering system and a grid. 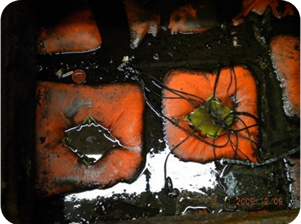 Sample on the right: Wash bay discharge is maintained by SupaZorb Filter bags and grid. Sample was taken after using SupaZorb products for four months - thus demonstrating that the Oil Separator can be cleaned less frequently when using SupaZorb products. In a nut shell - what is SupaZorb's capabilities? 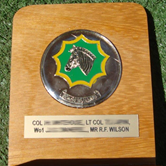 Our South African client base involves the Motor Industry, Mining Industry and Governmental Departments such as Water Affairs and Department of Defense. 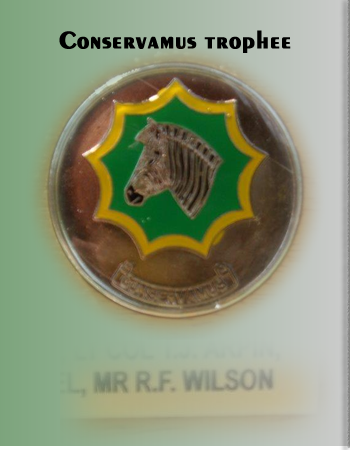 We find pride in our products and are proud to present them to the world. 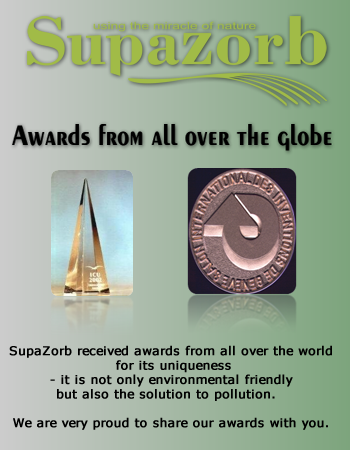 SupaZorb received awards from all over the world for its uniqueness - it is not only environmental friendly but also the solution to pollution. 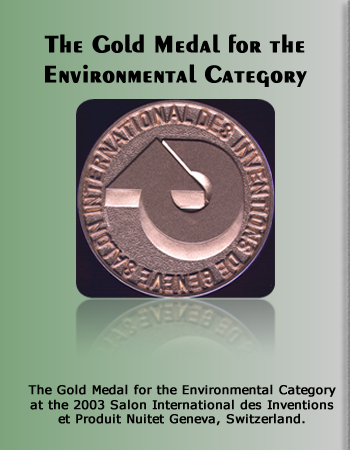 We are very proud to share our awards with you. 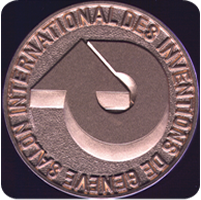 SupaZorb received The Gold Medal for the Environmental Category at the 2003 Salon International des Inventions et Produit Nuitet Geneva, Switzerland. 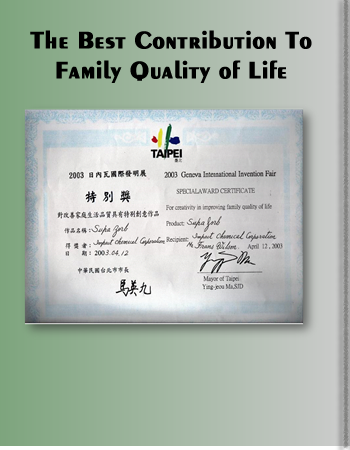 In 2003, SupaZorb was presented with a trophy for, The Best Contribution To Family Quality of Life, in Taipei. 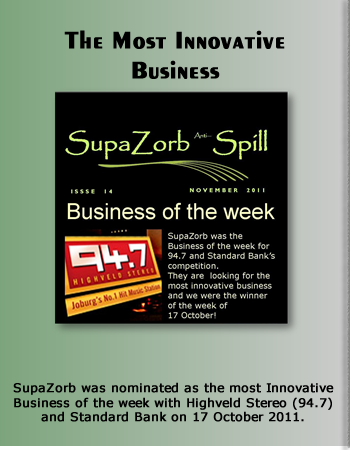 SupaZorb was nominated as the most Innovative Business of the week with Highveld Stereo (94.7) and Standard Bank on 17 October 2011. 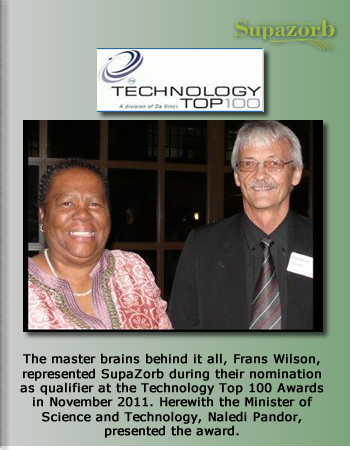 The master brains behind it all, Frans Wilson, represented SupaZorb during their nomination as qualifier at the Technology Top 100 Awards in November 2011. 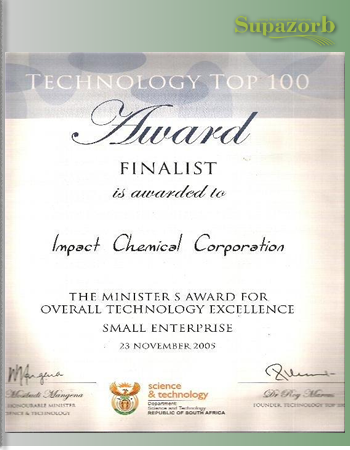 Herewith the Minister of Science and Technology, Naledi Pandor, presented the award. 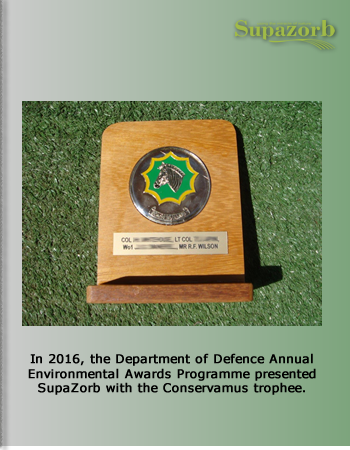 In 2016, the Department of Defence Annual Environmental Awards Programme presented SupaZorb with the Conservamus trophee. 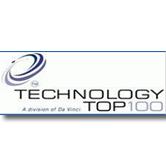 Advanced geotechnologies can be harnessed for non-destructive detection and mapping of subsurface UXO's.